KANSAS CITY, Mo. -- Andrew Wenger looked a bit sheepish the moment he was asked what teams and players he followed growing up. He knew his reply wasn't all that daring. "Well, Manchester United," he said. "And, of course, David Beckham." Now, Wenger may have a chance to play against him. The expansion Montreal Impact selected the Duke forward with the first overall pick in the MLS SuperDraft on Thursday, choosing the most complete player available in the two-round draft. The Hermann Trophy winner as the top NCAA player, Wenger was the ACC defensive player of the year last season and offensive player of the year this season, finishing with 17 goals and eight assists. "We have a lot of potential," said Wenger, who plans to join the new MLS club in a couple weeks, once his responsibilities with the U.S. men's national under-23 team are through. "It's exciting." Just as exciting is the chance to potentially play against Beckham. The midfielder's contract with the Los Angeles Galaxy has expired, but negotiations are ongoing and Beckham reportedly has said he'd rather remain in Los Angeles than return to playing in Europe. Montreal plays the MLS champion Galaxy on May 12. Akron forward Darren Mattocks was selected second by the Vancouver Whitecaps. UCLA midfielder Kelyn Rowe went third to New England, followed by UC Santa Barbara's Luis Silva to Toronto FC and Maryland forward Casey Townsend to Chivas USA. The Impact were expected to choose between Wenger and Mattocks, who many believe has greater long-term potential. Club officials wavered between the two until a couple days ago, ultimately going with Wenger's versatility over Mattocks' scoring punch. "It's going to be awesome," Wenger said. "I've never lived in a big city. I've been watching a lot of the Travel Channel lately, so at least I know of some nice places to eat." 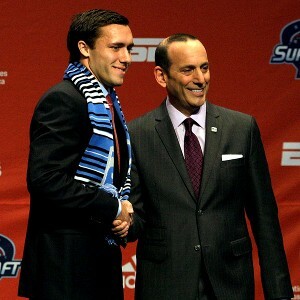 Jamie Squire/Getty Images Andrew Wenger is greeted by MLS commissioner Don Garber after he was selected No. 1 overall by the Montreal Impact in Thursday's draft. Montreal coach Jesse Marsch, a longtime MLS star, said he doesn't know where Wenger will fit on the field. He's shown ability at forward and midfielder and as a lockdown defender. "I think he was the best soccer player available," Marsch said. "We followed him very closely, and we just felt he had the best future, short term and long term, in the draft." Mattocks is a speedy Jamaican who wound up at powerhouse Akron because he wanted to acclimate himself to playing in colder weather. He'll certainly get that opportunity in Vancouver. "I knew from the get-go that it would be between me and Wenger. They picked Wenger first and that's OK with me," said Mattocks, a Hermann Trophy semifinalist and Mid-American Conference player of the year, who scored 39 goals in 47 games during his two years with the Zips. Vancouver president Bob Lenarduzzi said his decision was easy once Montreal made its pick. "It's been the consensus that the top two were Wenger and Mattocks," Lenarduzzi said. "We just needed Montreal to make up their minds. All along you sort of jokingly ask what they're going to do, but they never were going to tell me anything." Sam Garza became the second player from UC Santa Barbara to be drafted when he went sixth to San Jose. Garza began his career at Denver before scoring 17 goals in two seasons for the Gauchos, helping them to a 15-7-1 record and the third round of the NCAA tournament this season. Garza's grandfather, Bill Cross, was a running back for the Chicago Cardinals in the NFL. Louisville midfielder Nick DeLeon was drafted seventh by D.C. United. His teammate, Austin Berry, went two spots later to Chicago. Connecticut defender Andrew Jean-Baptiste went eighth to Portland and Ethan Finlay of Creighton was chosen by Columbus with the 10th overall pick. North Carolina's Matt Hedges went 11th to FC Dallas. Notre Dame defender Aaron Maund went next to Toronto FC, followed by UCLA's Chandler Hoffman to Philadelphia, UConn's Tony Cascio to Colorado and Creighton defender Andrew Duran to Seattle. The biggest roar at the Kansas City Convention Center came when hometown club Sporting Kansas City made South Florida forward Dom Dwyer the No. 16 overall pick. Several hundred fans dressed in blue that had congregated to the side of the expansive ballroom burst into applause. Dwyer, who is originally from London, began his career at Tyler Junior College in Texas. He was the Big East offensive player of the year after scoring 16 goals in 21 games for the Bulls. "You hear rumors about teams and where you might go, but I didn't know anything about Kansas City," Dwyer said. "I'm excited to be here." Want to submit a question for Mike Reiss' weekly Patriots mailbag? Click here and come back every Tuesday around noon for the 'bag.